I joined the industry from what you could say was a rather strange background. I graduated with a degree in Environmental Chemistry, then joined the Scottish Environment Agency, prior to managing wastewater treatment plants in the North east of Scotland. In 2006, I joined Diageo in the maltings at Burghead & Roseisle, as one of a team of managers. I was there during the construction and the opening of Roseisle Distillery. In 2010, I was transferred (a thing that Diageo does as part of their management cycle) to the Glenlossie Complex just outside Elgin, where I managed Glenlossie and Mannochmore Distilleries. In 2014, I was then transferred to Glen Spey in Rothes. 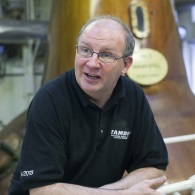 In December 2014, I was then delighted to join the team at Tamdhu, in the role of Distillery Manager. I’ve actually got two highlights. In 2015, I was thrilled to be part of the team that developed Tamdhu Batch Strength 1, with our Master Blender John Glass. It went on to win Gold at the San Francisco World Spirits Competition, three weeks after its release. My second highlight was getting my signature onto Tamdhu Batch Strength 2, which was released in November 2016. Like most managers in the business, it leaves a legacy and I know it’s something both my parents would have loved to have seen. My Dad enjoyed a dram or two! My brother marked the occasion by buying 50 bottles and gifting bottles to the rest of my family and all his business clients. The first whisky I tasted would have been a Famous Grouse, given to me by my Dad when I was wee boy aged 5 or 6. It was put on a cloth to help cure toothache. I don’t remember it working but I do remember it tasted awful to me, not because it was Grouse just because it was whisky! The first drams that I truly remember would have been in around 1993, though I’m sure I’d have shared a few before then. I was working in Oxfordshire for a year with Esso. At that time, I wanted to sound as though I knew all about whisky so I regularly returned from a weekend back home with a bottle of Bowmore. It was something that folk further south never really saw, as it was always the likes of Glenfiddich and Macallan on the top shelf in a bar. So I think I was trying to look knowledgeable and impressive, not too sure it worked though! That’s an interesting question for me, as it was something I never thought much about before coming to Tamdhu. Despite working in whisky, my previous drink of choice was Captain Morgan Spiced Rum and Coke. I have since learned a significant amount and have a real “every day is a school day” philosophy. There was a time that I thought casks were just the thing the spirit spent time in to mature, but now my knowledge has improved, I realise that good wood selection has such an influence on quality that it needs constant monitoring. The range of flavours and quality never fails to amaze me, and that allows consumers to explore and find out what suits them best. Now my drink of choice is actually whisky and particularly sherry matured malts. Whether my palate has changed and the sugary sweetness of the Morgan’s is no longer to my taste, or whether I have just matured like the whisky I am not sure, but the complexity of whisky is certainly more to my taste now. I hope I’ll still be at Tamdhu, I never want to leave! In previous roles, I was never so immersed in a brand, but having spent over two years at Tamdhu, I am extremely passionate about so many things. The team at Tamdhu are all so enthusiastic about their work and actually seem to enjoy it! They want to see the brand develop and expand and are always keen to hear about sales, new releases and what our next project is, whether that be site-based or with the brand itself. It’s sometimes hard to remain patient, though I have always said that patience is one of the things you need to make great whisky, but I so want us to have some other expressions; single casks, perhaps a 15 or 18 Year Old. These will come with time and good stock management, but I still want to be at Tamdhu when they arrive. I was sampling the very first cask of Tamdhu filled after Ian Macleod Distillers resumed production in 2012. It’s a first fill sherry cask, milled, mashed, distilled and filled by my Assistant Manager, Iain Whitecross. We have been drawing a sample each year since March 2015 just to see how it has been maturing and how much colour is developing. It’s remarkable to see, nose and taste the journey that the spirit is now on and it will be really interesting to continue that year-on-year until the cask is called forward for disgorge. It has a real depth of colour already but, as you would imagine, it is still a young whisky. This is only something I have started to explore recently. I am not adventurous with food I’m afraid, as my tastes are quite plain in that respect. Often if I’m enjoying an older whisky, I’ll have a simple cheese platter to go with it. Again, as I’ve gotten older, instead of having a sweet at the end of a meal I would rather have a good malt and some Scottish cheeses. Peppered crowdie on oatcakes is my current favourite with either a Tamdhu 10 Year Old or a Glenfarclas 18 Year Old. It’s got to be with my oldest brother, Douglas, and with the rest of my family around. Despite there being quite a few McIntyres in the family, it’s only Doug who also enjoys a dram. Ideally at my house at Tamdhu, but it’s not often we are all together there, so his house in Glasgow would be my second choice. Glasgow is my home city and I’m proud of that so what better a place to celebrate families and friendships? It has got to be something around an assurance scheme for casks and ensuring that cask quality is something that is consistent. I would like to see something on the bottle label that tells the consumer if caramel has been added to the spirit for colour. While I understand that consistency of colour is relevant for the larger blends out there, I also feel that for a good quality single malt there should be no need to add caramel to simply make it look better in a bottle. We exclusively use sherry casks for our Tamdhu single malt and have no need to add caramel for colour as it all comes from the wood. Dare I say it, but Glengoyne 21 Year Old has to be up there as it is the kind of dram that I aspire Tamdhu to be at, hopefully when it’s 18! The depth of flavours, the colour and quality is superb. As you can tell, I love the sherry maturation, like Tamdhu, the flavours of fruits – sultana and pear, vanilla, the subtleness of fudge and even hint of spice, really bounce around your palate and make it a dram to sit, savour and explore. Many thanks to Sandy McIntyre. Who will be our next Whisky Insider? Click back soon to find out!